Howard and Janelle Freshman of Long Beach, California recently led an orthopaedic team which brought medical care and equipment to the Rio San Juan communities of Buena Vista, Boca de Sabalos and Kilometro 20, and the area's capital city, San Carlos. 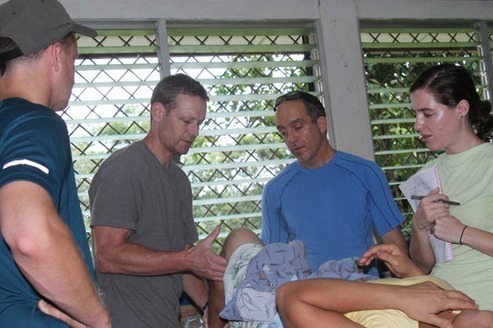 This was the couple's third mission to southern Nicaragua in conjunction with Torrance Orthopaedic and Sports Medicine Group of Torrance, Calif. The team consisted of TOSMG orthopaedic surgeons, Dr. Nicholas M. Halikis, who has particpated in all three missions, and Dr. Todd A. Shrader, who made his first trip; TOSMG physical therapist Janelle Freshman, PT, DPT, OCS, CHT; coordinator and photographer Howard Freshman; JD Pault sales representative for Team Makena which specializes in braces; Amanda Shrader who provided support services; and Peace Corps volunteers stationed in the San Carlos Natalie Pritchett and Teresa Sifferman. Rafael Choiseul-Praslin coordinated the entire mission for San Juan Rio Relief in Nicaragua. About 300 patients were seen and Dr. Halikis performed eight surgeries including an ulnar nerve transposition, trigger finger releases, a carpal tunnel release, joint fusions in the fingers and mass excision of the hand. Additonally, the team brought a donated arthroscopic surgery machine which will be used on subsequent missions. The doctors plan to instruct the local surgeons on its use and it will be donated to Hospital Luis Felipe Moncado in San Carlos. Torrance Memorial Medical Center in Torrance, CA donated medication for the mission. 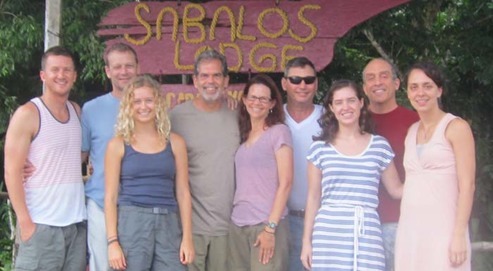 (L-R) JD Pault, Dr. Todd A. Shrader, Amanda Shrader, Howard Freshman, Janelle Freshman, Rafael Choiseul-Praslin, Teresa Sifferman, Nicholas M. Halikis and Natalie Pritchett at Sabalos Lodge in Boca de Sabalos.